My character Ronin Catholic has too much stuff. Help poke this Mary-Sue down to size so that I can have fun with him again. A videogame character, from the nonexistent 1991 Famicom game "Rurouni Ronin Katorikko Kitsune Gaiden Z". He starts out looking like a pink-haired human, but quickly develops bat wings. * When out of MP, he reverts to the bat-winged human mode. 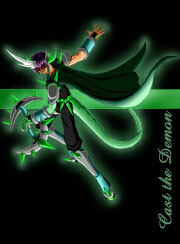 * His normal mode is a kemono fox armed with a rosary/kusarigama. He runs fast. * Hitting Select cycles him to bat mode. He's a lot smaller, flies around, and fights with a boomerang he can fire in any direction. * Hitting Select again cycles him to tanuki mode. He moves as slowly as the human, but his tetsubo does heavy damage and hitting Down+B turns him into an indestructible stone statue. * Hitting Select while in tanuki mode turns him back into a kitsune. * Pressing Start opens a spell menu; once closed, hitting Select will cast the spell instead of transforming. * When he grabs a powerup, its icon appears on his HUD under the "Belly" heading. Meats restore lots of HP, but do so 1 HP at a time for a long period; candies restore almost nothing, but do it all at once. When there's already an item in the Belly slot, Tendo will refuse to pick any others up. * If he's eaten Atma Piza, he becomes Atma Ronin (a precursor to Pikachu in his canon, a shout out in reality) who moves really fast, flies, and does loads of damage. His rapier is so fast that it only gets one attack frame and fires lightning bolts which resemble Elec Man's weapon. He's only Nearly Invincible in this mode, as bosses can still chip away 1 or 2 HP from him, and the End Boss will still kill him instantly. The nonexistent anime, simply entitled "Ronin Catholic Z", did not really air in Japan in 2003. Ninto Denichi looked human, but roughly halfway through the series he was retconned into a pink kemono fox with bat wings. At the start of Episode 2, everyone normally called him "Ronin." * He became a ronin because he was accused of disloyalty to the shogun(named Lord Shogun) on account of his being a Catholic. This came up after two years of faithful service. * He went to Buttwarts School of Spellcraft and Magery; he learned alongside expies of Lina Inverse, Sailor Mercury, and Black Mage Evilwizardington. His headmaster was simply known as "H. Potter". The Alchemy teacher, Professor Malfoy, burst into flames when he was enraged by one of Ronin's stupid answers. * He was born specifically to replace Odin/Zeus/Raided, who got booted out of Valerie Hall for pervishness unbecoming a false Deity. Seriously, Jesus even told him so. * The rest of the pantheon thought of him as a Replacement Scrappy. * When extremely angry, he would temporarily turn yellow and fire huge lightning attacks, while yelling "PIKACHU! ", usually with multiple vowels and exclamation points. * His main recurring enemy was himself from another dimension, who wore black armor. His hair was gray, one of his wings was skeletal, and he fought with a lightsaber. This guy was called Chaos, and learned all his evil magicks from playing AD&D as a child, against his father's wishes. * Ronin and Chaos could only cast damage-inflicting spells on things they had empathy for; in Ronin's case, cute mammals, some women(especially his fiancee), Internet memes, and Chaos. In Chaos's case, Ronin(whom he thought of has himself). * He once went to Australia, passed himself off as a dingo, learned to take it easy, and helped Knuckles the Echidna defeat Chaos(the one from Sonic Adventure). * Parodisney versions of Afenhouse, Sonic Adventure 2, Hamtaro, and Once Piece(King of the Software Pirates!) all seemed disjointed, but were actually part of the plot. * Chaos gained additional powers from Plotholes, of which the series was full; namely, Chaos got killed twice, one of those being a Fusion Dance with Ronin in the previous episode to this power's revelation. * After the truly final fight with Chaos, Ronin had to fight his boss by rewriting the earlier episodes to make himself seem less like an incompetent pervert. He met marginal success, and managed to escape from (but not defeat) the Demonic Middle Manager Fraust. * He built the worlds of Nintendo Quest and Wolf's Quest, but his craftsmanship is shoddy at best. * His wife was stated to have so much HP that, in the Fantastic Voyage episode, if he expanded to full size inside of her body, it would crush him to dead and cause her minor intestinal discomfort. His HP was in the high 300s. He was the expy for Kiby in Captain N season 4; odd, because Kirby is 1st Party Nintendo (they were probably afraid of the vacuum cleaner company). * When the N Team went to Dream Land inside of GameBoy (Kirby's Dream Land + Link's Awakening) to search for a clone of the recently deceased Link, they found a samurai-dressed guy who otherwise looked like a Goomba with arms. * He protected Animal Village from the Nightmares, but willingly left when he heard GameBoy's batteries might die soon, and they didn't have any 5-gallon AAA batteries on hand to replace them with. * Though he was Game Boy colored when he first joined, the next episode had him pink, his armor red, and his hat yellow with no explanation. * He dressed as a red mage when the group went back to Final Fantasy to fight Lich. * He gained Tanooki suit powers from eating leaves in the Mushroom Kingdom. * He had a bionic arm and an army helmet when they went to Commando Land; he got separated from the group, brainwashed by the bad guys, and fans had to vote whether he'd stay or go. Having recently lost Link(killed by Gannon), Simon(Heel face turn), and GameBoy(battery death; no big loss) the fans refused. * Multiple write-ins also suggested that he keep the Tanooki mode look as his base appearance. * For the TMNT and Mortal Kombat episodes, he wore a samurai helmet and fought with dual pizza cutters. * In the Mortal Kombat episode, he played the game so hard, for so long, that the characters ran out of blood. "I hope nobody thinks we censored all the blood out when we ship this," he remarked. * In the Sonic the Hedgehog crossover / Sonic Adventure 2 promotion, he as used as their spy for the Sonic team...after all, the now-preteen tanuki blended in just fine alongside the likes of Tails, Antoine, and Sally Acorn. Snively played the role of Eggman, to a now-dead Julian as the game's dead Gerald.